After the triumph of Elmore Court back in November, we were fortunate enough last month to get the gig at Ellenborough Park running a 30 minute demonstration and question and answer session to a room of approximately 50 lovely ladies. Ellenborough Park is a stunning hotel based in the heart of the Cotswolds and is the perfect location for luxury country retreats, romantic breaks and weddings. The occasion was held as part of their renowned ‘Ladies Lunch Club’ events which invites ladies from the local community to welcome drinks, an exquisite 2 course lunch followed by an afternoon demonstration. We opened the show by speaking a little about ourselves, who we were, where we came from and what we did as business. It was then onto the task in hand – decorating the Christmas cake. We were stood confidently at the front with a camera set up and an overhead screen so everybody could see our hands and what we were doing. It was my job (Bee) to practically demonstrate each step while Xavier talked through each step and treated the guests to a couple tips along the way. 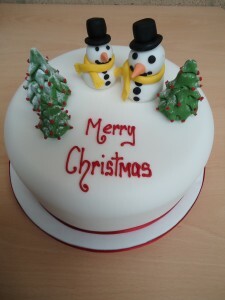 We started by covering a dummy cake with white icing to give the snowy effect before placing this on an iced board. To create an iced board we iced the base board of the cake by simply rolling out some icing or chocolate paste (depending on what the cake is going to be covered in), wet the board place it on the top, smooth it over and trim around the edge of the board and wrap the ribbon around the edge to give a special finish. It was then onto the decorations where we made some Christmas classic’s in the shape of snowmen and Christmas trees to put the icing on the cake, literally! These were created using sugar paste and colouring which are easily accessible in your local supermarket. We then carved these into the individual pieces before constructing them into the snowmen and Christmas Trees. We received a great reception from all the guests who attended the event last month with many of them coming up to us post-event asking us for more tips and general enquiries. It leaves us to say a massive thank you to Ellenborough Park for having us and we hope all the ladies come up trumps with their Christmas bakes this year. CCD is now looking into their next classes schedule and would like you to tell us what you would like to come and see/learn and we will do our best to deliver. 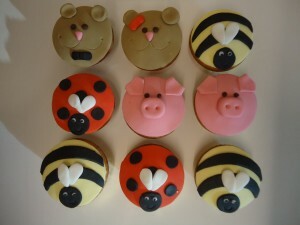 Why not email us your ideas admin@contemporarycakedesigns.com.